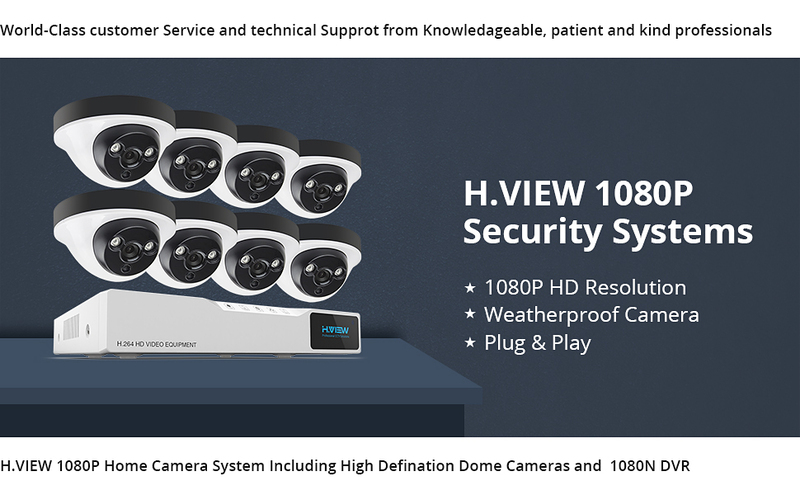 Including 8 High Definition 2.0 Megapixel (1080P) Metal Weatherproof IP67 Cameras for Amazing Video Quality and Clarity.8 channel 3 in 1 DVR, support IP/AHD/Analog camera,with 4 Audio inputs, can hear voice via install mic. Use of Motion Detection and/or Lower Resolution Settings. Automatically Overwritten the oldest data/or when hard drive is full with data, system will send notifications on screen. View and Record with Remote Viewing on iPhone, iPad and Android Devices (with included app). Remote Access on Windows PC,(no month fee,completely free) ,Designed to be amazingly easy to set up. Motion Detection and Alerts Specify which areas of the camera's motion grid are active, When camera detects motion, it can activate multiple security responses, such as turn on DVR's buzzer, sending an alert email, and triggering recording. All systems CE & FCC certified with qualified power supplies.Provide Full 1-Year Warranty and Lifetime Support Provided Directly from H.View. The Cameras are completely 1080P Security Cameras providesyou with High Definition 2 Megapixel Video. These cameras can be used indoor and outdoor, each camera with IP66 Wehatherproof design. The cameras comes with 3.6mm lens which is appropriate for most applications. 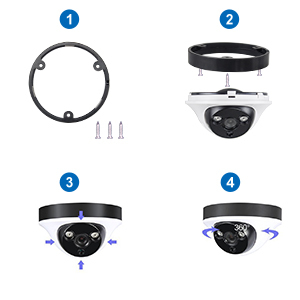 Built-in 2 Array IR-Leds, See up to 100 foot in complete darkness with the built in Infrared LEDs.Each H.VIEW system is simple and easy to set up. It comes with a product manual, Which is extremely easy to follow, Finally, this system comes with sign and surveillance stickers to use where you wish as a deterrent for theft and intruders. The timer axis design under the split screen makes it convenient for you to freely go back to different days, hours, or minutes to see the events you missed. Bulit in 2 Array Leds,enhance the distance of night vision to 30M .Clearly recongize the human face and plate number. 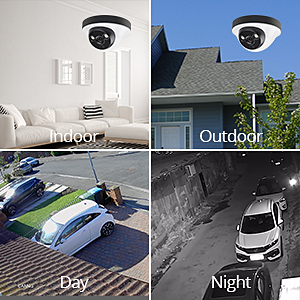 Our camera aimed to avoid all danger things at night ,enhance the fatest distance of camera can reach,Protect your yard and your home with 1 camera,has longer distance than 24 leds. 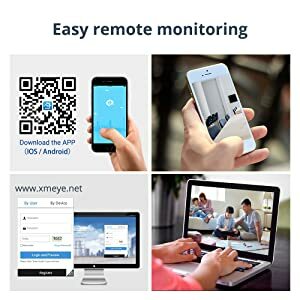 Multiple recording modes, advanced motion detection, email alert, night vision, QR-Code scan, remote web browser & smartphone viewing and exceptional long distance transmit range.You could use this system in a smarter way by customizing motion detection as you need, i.e. set a perimeter zone, specify which areas of the camera's motion grid are active and even set a 24x7 schedule for it. 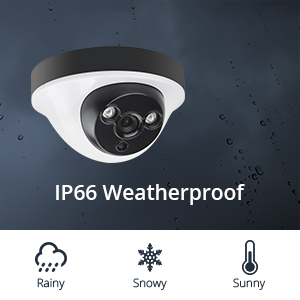 IP66 Mental material camera can catch every important moment under any weather, Never worry about Nature brings, rain, storm, snow or sleet. If camera damaged within one year we can send new replacement to you with no reason. Say Goodbye to the traditional, complex setup process, requiring you to have an online degree. Anyone can set it up quickly and easily. Instantly view live video on your computer, tablet or phone anytime, anywhere. This system uses standard BNC cabling to deliver stunning 1080p HD video. Simply connect the one end of the siamese BNC cable to the DVR and a power outlet and the other end to the camera connector.